MEIZHI R450 450W Reflector: Buy or Avoid? The MEIZHI R450 Reflector-Series 450W LED grow light is going head to head with well-known, affordable brands like VIPASPECTRA and Mars Hydro. Meizhi claims the R450 can replace a 450W HID (high intensity discharge) lamp of High Pressure Sodium (HPS) or Metal Halide (MH) and save you money in the process. They cost more up front, but usually more than pay for themselves in lower running costs. The MEIZHI R450 panel is a full-spectrum light, because it has LEDs that are blue (450-475nm), green (620-630nm), red (650-660nm), infrared (730nm) and white (5500-6500K). Although some of the 5-watt LED bulbs look like they aren’t working, it’s because those are IR, or infrared, not visible to the human eye. The “nm” abbreviation stands for “nanometer,” a unit for measuring the length of light waves. The visible range for most humans is around 380 to 780nm, and that’s the range most useful to plants. It’s what they need for photosynthesis to convert light energy into chemical energy to grow and bloom. Full-spectrum LED lights like the R450 bring the sun indoors, but without UV radiation and without overheating your plants. As long as you hang the lights at the recommended heights above the plants, you should never have to worry about them burning the leaves. Generally, the maximum and minimum distances for hanging the R450 would be 30 inches down to 18 inches above the canopy of leaves. The PAR measurement that we’ll get to in a moment was taken at the center under the light panel when it was 18 inches above the target. The 120-degree design of the MEIZHI reflector means the illumination from the ninety Epistar 5-watt LEDs is concentrated on your cannabis. This one light can cover a 2-foot by 3.5-foot space so you can sprout a lot of seedlings at once, or raise up to 4 plants at a time, depending on their strain. The panel is designed to be daisy-chained. You can link two or three of the same lights together to cover a larger space. That way you can run them all off the same timer or controller. PAR, or photosynthetically active radiation, is a good way to measure the capability of an LED light. 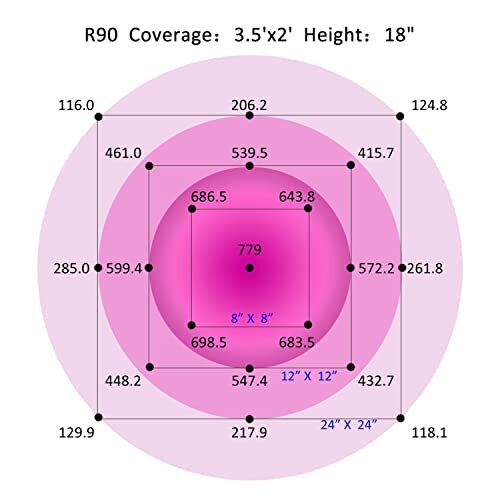 The R450 has an outstanding rating of 779umol (micro mols). Anything over 600 means it’s a good light. If you compare the R450’s PAR to similar lights from other brands, or even the similar Spider Farmer from MEIZHI, you’ll see that it has a superior rating without a big price tag. Just FYI: some companies tout their lumen output, but that’s really only valid for house lights and lamps. Plants don’t care about this measurement. 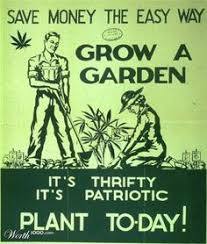 The light wavelengths a plant needs and what light is visible to us are not the same thing. Lumens are for humans, as the saying goes. The R450 may have 90 5W LEDs going when both the Grow and Bloom switches are on, but it only consumes 195 watts of electricity. It has built-in heat sinks and cooling fans so it doesn’t run too hot. 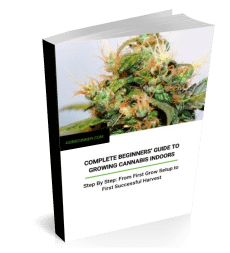 Some owners have commented that this panel does put out more heat than some, so it’s still a good idea to have a ventilation system, especially during the flowering phase. So what happens when you turn on the light? The Grow switch turns on about two-thirds of the LEDs, all the blue and yellow and white light, plus some of the red. This mix of color is best for the vegetative stage. When you flip on the Bloom switch, you add in the rest of the red light to encourage big, healthy flowers and resin-covered buds. With the two options, you can save money on electricity by not running the panel at full power until you need it for flowering. MEIZHI reports that the light operates at a noise level of 53dB. That’s about as much noise as a conversation or a fan on medium so it shouldn’t draw much attention to your grow tent. The R450 panel measures 15.7 by 8.3 by 2.8 inches and weighs less than 8 pounds. It comes with a hanging kit and power cord. If you have non-standard electricity (like a generator), it can run off anything from 85 to 265 volts as long as the current is either 1.781A for 110V or 0.9042A for 220V. If there is a problem, MEIZHI accepts returns unconditionally up to 30 days after purchase. Then they make free repairs within the first three months and pay-as-needed maintenance within the first year. 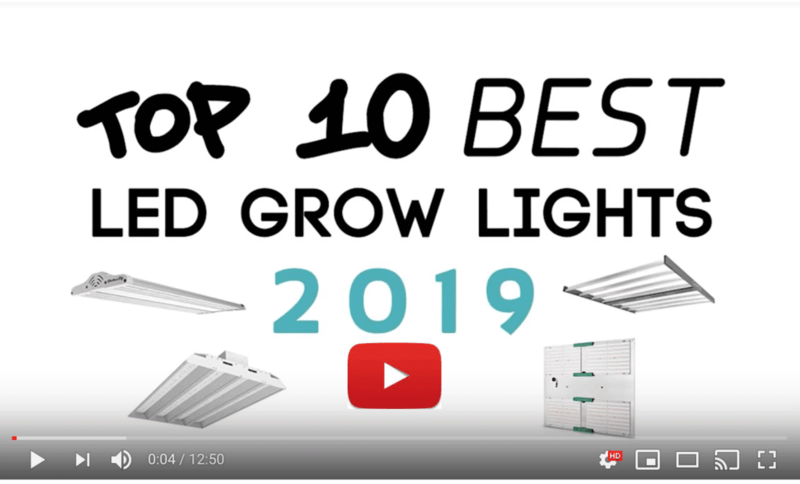 We’ve also taken a look at the Meizhi 300W grow light here, as well as the 450W model from Meizhi’s Spider Farmer range (the Spider Framer lights have adjustable dimmers). Versus the Spider Farmer 450W, PAR values for the R450 are better and power consumption lower, plus it’s a bit cheaper; however, it only has veg/flower switches, rather than the Spider Farmer’s adjustable dimmers. Also, as mentioned in the intro, we’re about 99% sure MarsHydro is another, slightly better known brand name used by the same manufacturer. MarsHydro lights are pretty popular with our readers. 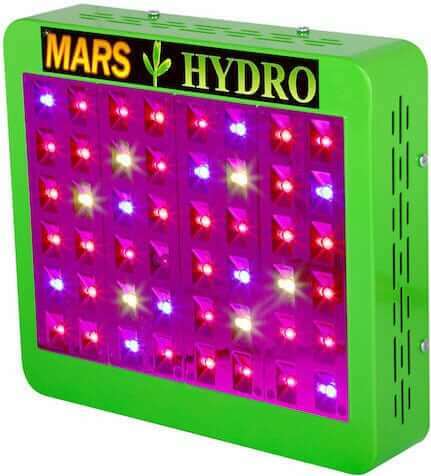 So also consider checking out the MarsHydro Reflector 480W, or for a bigger grow area the Mars600. I just had a look too and you’re spot on — they even have the same PAR values when you look at the diagrams. Looking closely at their respective websites, it appears to be the same company behind both brands. Plus, you’ll also find Spider Farmer lights, which are the same company again, but the Spider Farmer range has adjustable dimmers instead of just switches. It’s not an entirely uncommon thing. We’ve noticed some lights are marketed under different names in Europe and America (Roleadro and Galaxy Hydro, for instance). But it’s not too clear which brand is aimed at which market in this case. However, it’s also possible it’s just two different companies ‘white-labelling’ the exact same product, with the original Chinese manufacturer and its global service centers handling delivery, warranty and so on on the back end. In fact, we’ve spotted so many lookalike lights now that we’re even thinking of putting together an article to try to clear a few things up. Depending on whether we can find out enough useful info. Anyway, thanks for the comment! And good luck with your growing. p.s. Sorry for such a late reply!